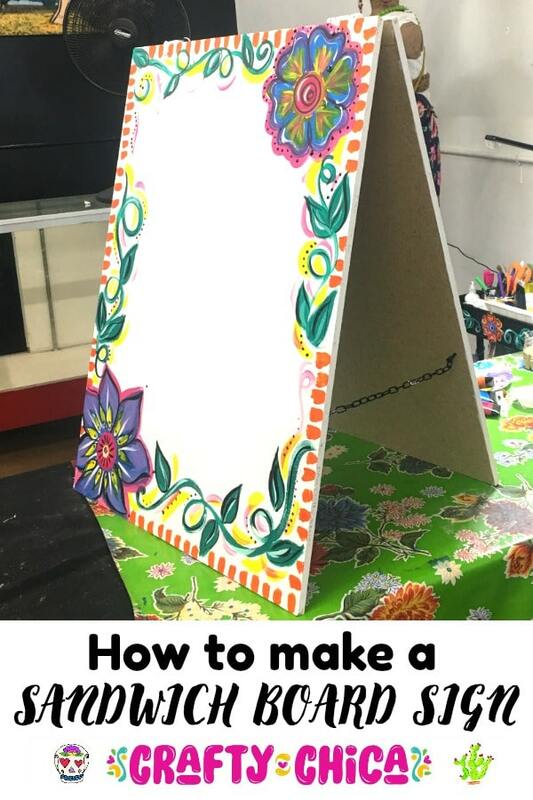 Have you ever needed or wanted to make sandwich board signs? I hope you nodded yes because sandwich board signs are mega helpful! And super fun to decorate! Say you have a lot of yards sales and are tired of drawing on a flimsy poster board that will just blow away and pollute your neighborhood. Maybe you are like me and have a store and want to lure in new shoppers who are driving by! Perhaps you are hosting a party and want to let your guests know where to park. Maybe you’d like a lowkey one for your garden or patio. 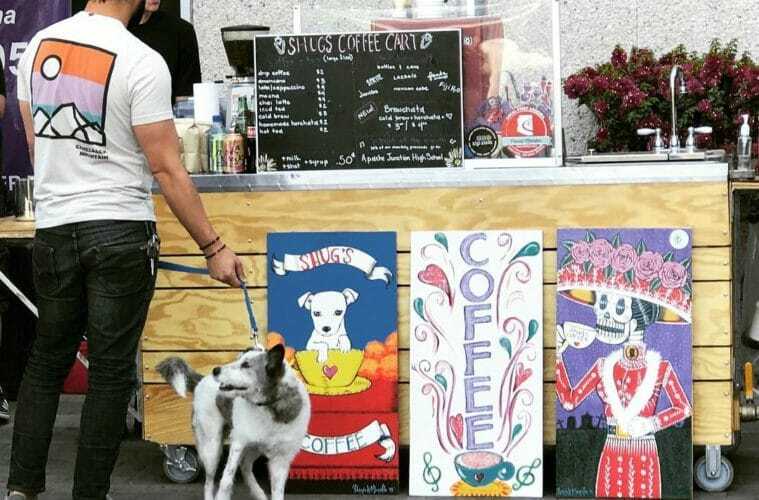 No matter what your reason, Patrick and I recently made some sandwich board signs and I learned a lot about the process – what to do and what not to do. 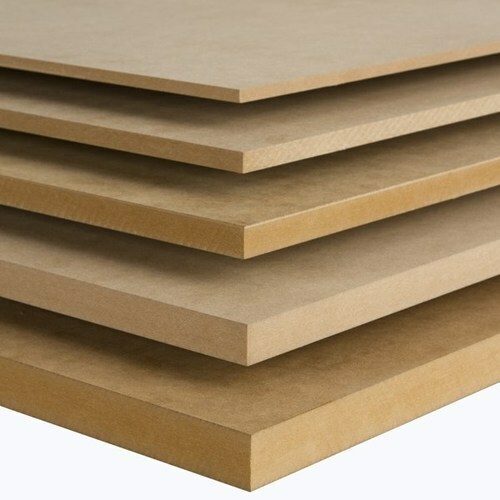 We used wood on one set and MDF on the other. I suggest going with MDF, it seemed to be more weatherproof (make sure to seal!) and smoother to paint. Decide how thick you want your board. The thicker it is, the heavier it is to haul in and out. If you live in a windy area, I’d go for a thicker version. We have crazy monsoons and ours held up nicely! Next, you’re going to need hardware. 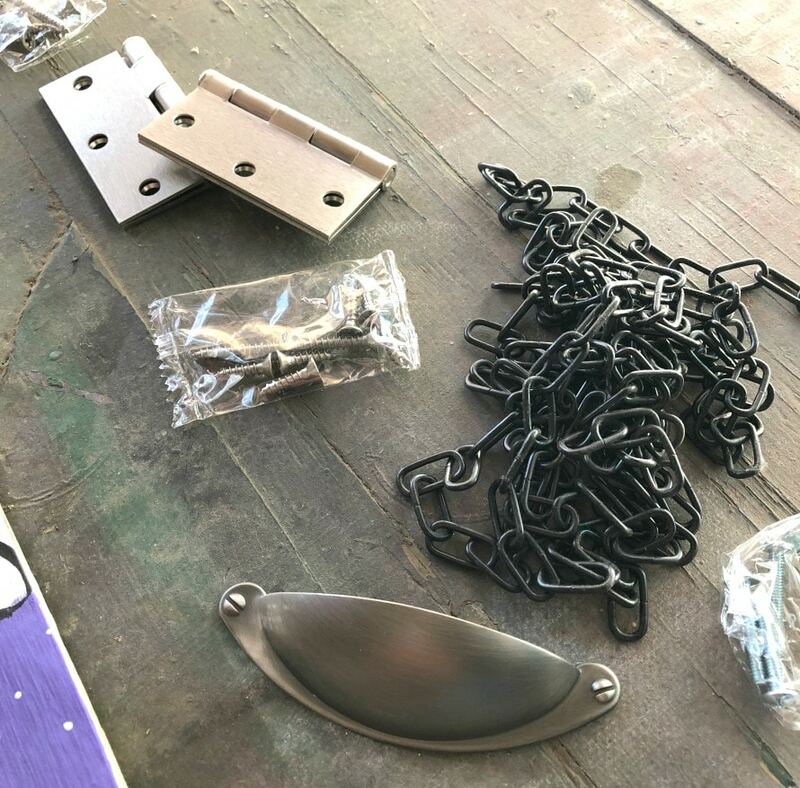 Hinges, chain, screws, and a handle. And a screwdriver. Definitely, buy a handle because the board can close on your fingers when you move it around. and if you are using a thicker board, it’ll hurt. 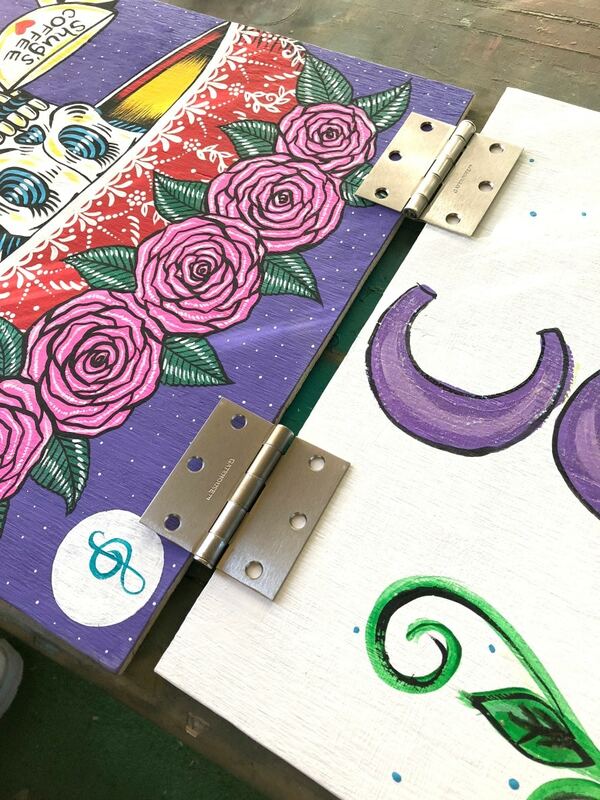 Decide if you want to attach the hardware before you paint or after. We did it both ways – I think it was an equal amount of awkwardness (I’m a leftie). To attach the hardware, line up both tops, drill holes for the screws to go into the hinges. 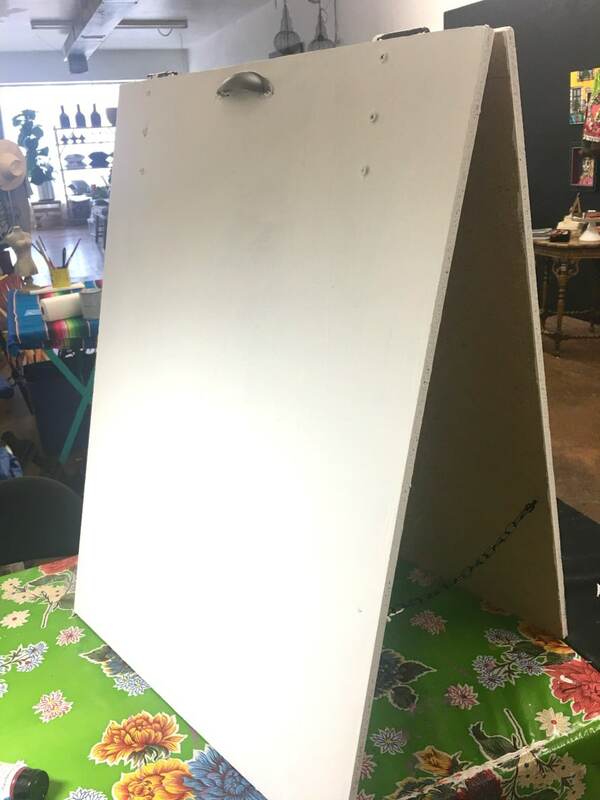 Use screws to add the chain on the inside of the board. I base coated the signs white and then used acrylic paints to paint the borders. If I ever make these again, I’m going to screw on a sheet of Plexiglas on top so I can use a dry erase marker. You could also base coat with chalk paint. Don’t forget to add varnish! I painted the other side as well. This is the set where we attached all the hardware. 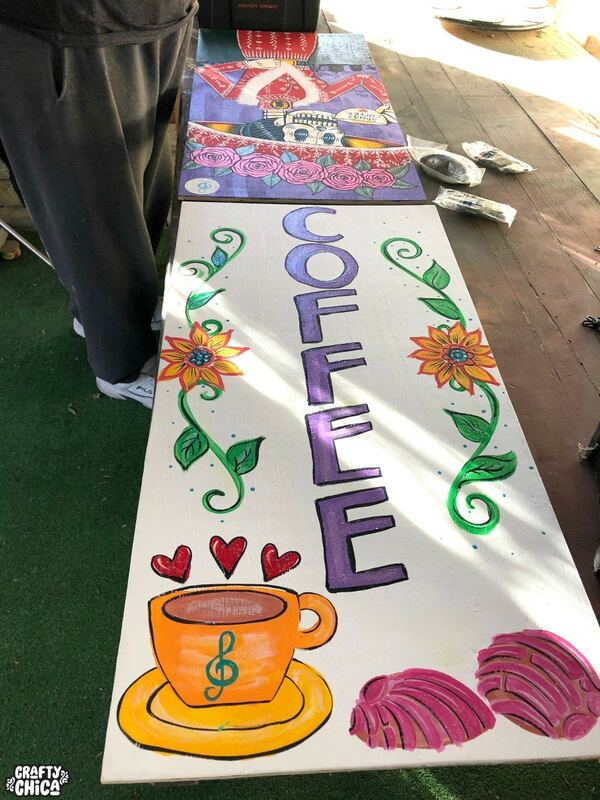 We painted a set for a client, they have a cute mobile coffee cart. But they liked our signs so much they decided not to connect the panels so they could set them out on display! 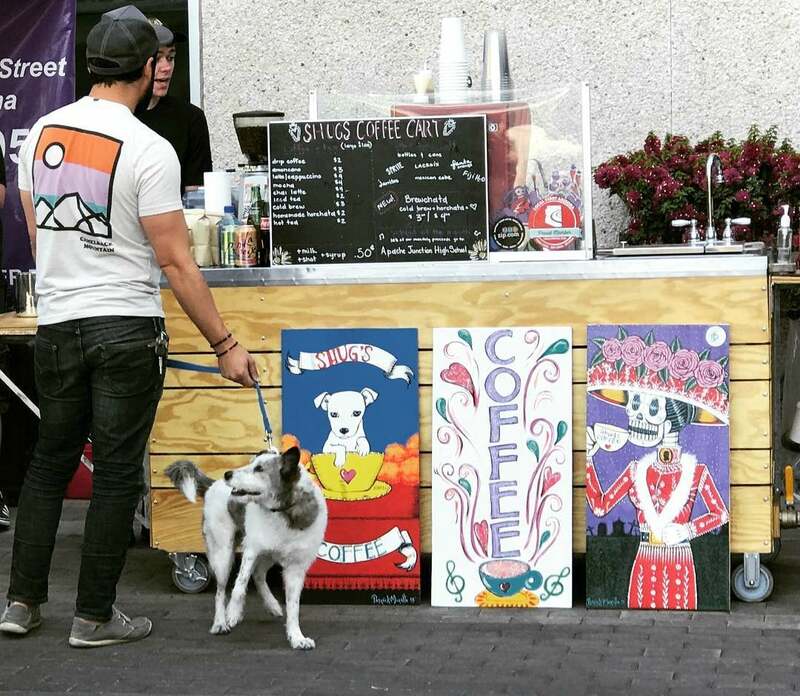 Our painted sandwich board signs set out on display in front of Shug’s Mobile coffee cart. And there you go – some very handsome looking sandwich board signs! You can adapt this idea to fit what you need. And heck, if you are in a bind, just buy one that is ready to go! I like this one because you can print off a cool poster design and just slide it in. 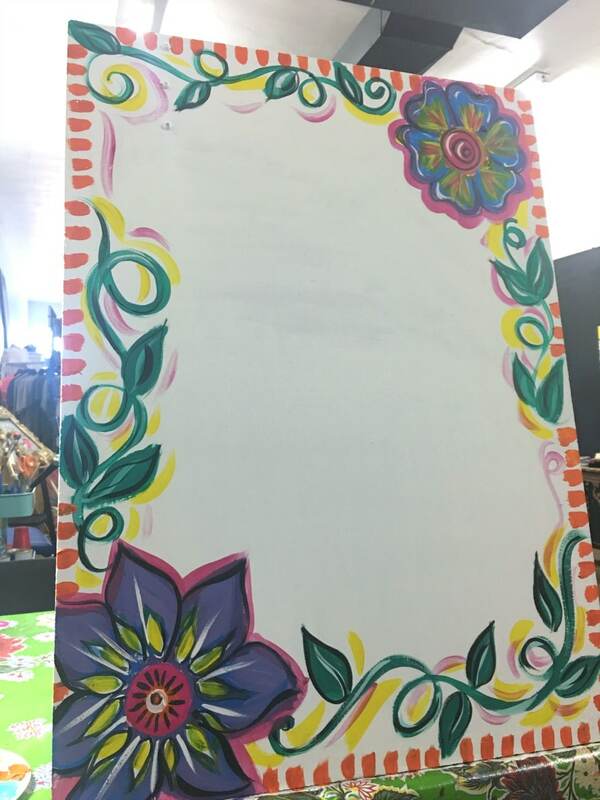 Or get this one and paint it in your own style. 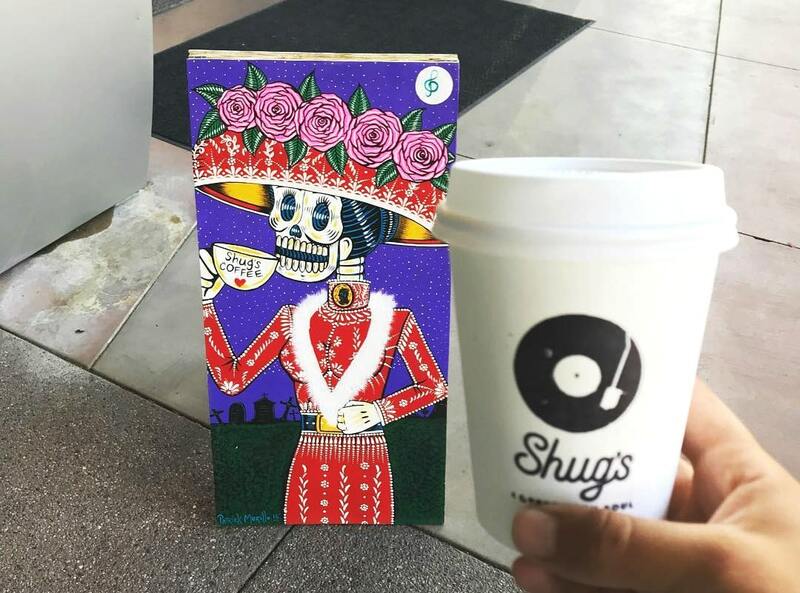 Previous ArticleRecap: My Pop-up at Mi Vida in Los Angeles! 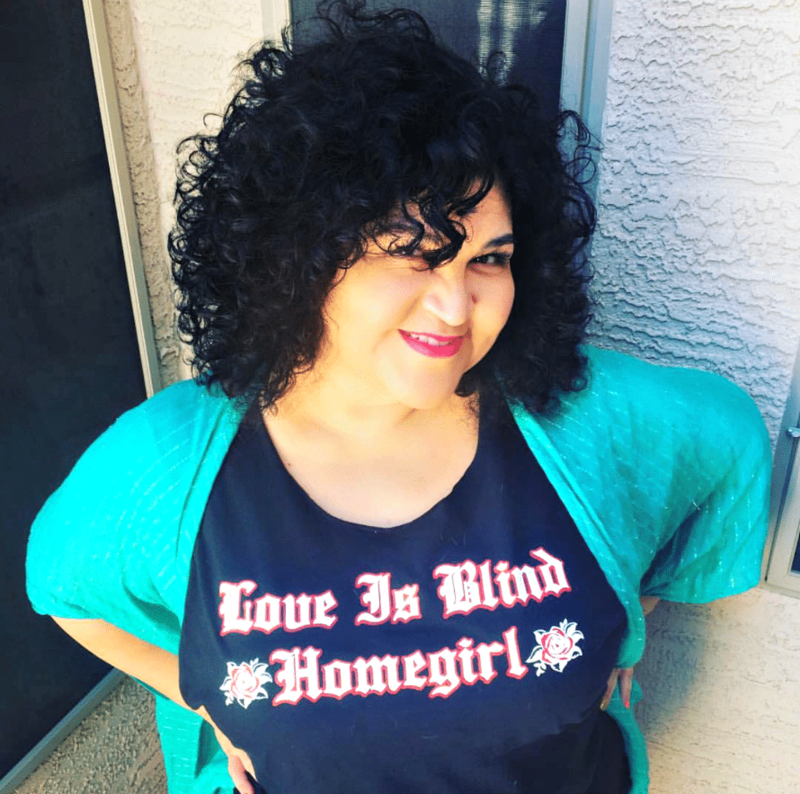 Artist and author Kathy Cano-Murillo, The Crafty Chica, makes a living spreading the gospel of glitter! 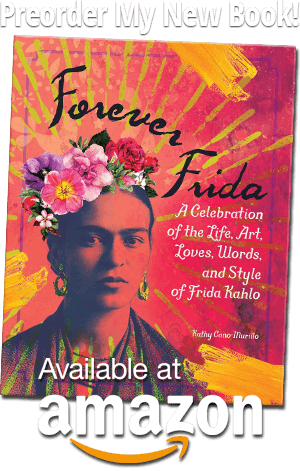 Literally through her DIY projects, & figuratively through her novels, speeches, and classes! 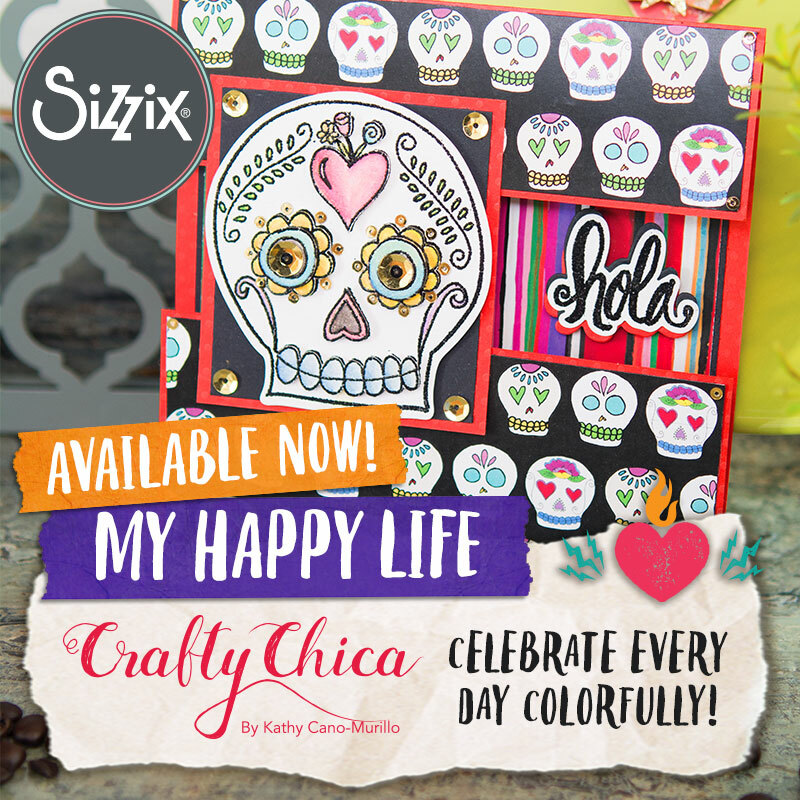 Hi, I’m Kathy, the Crafty Chica! I’m a speaker, artist, and author of nine books (two of them novels). 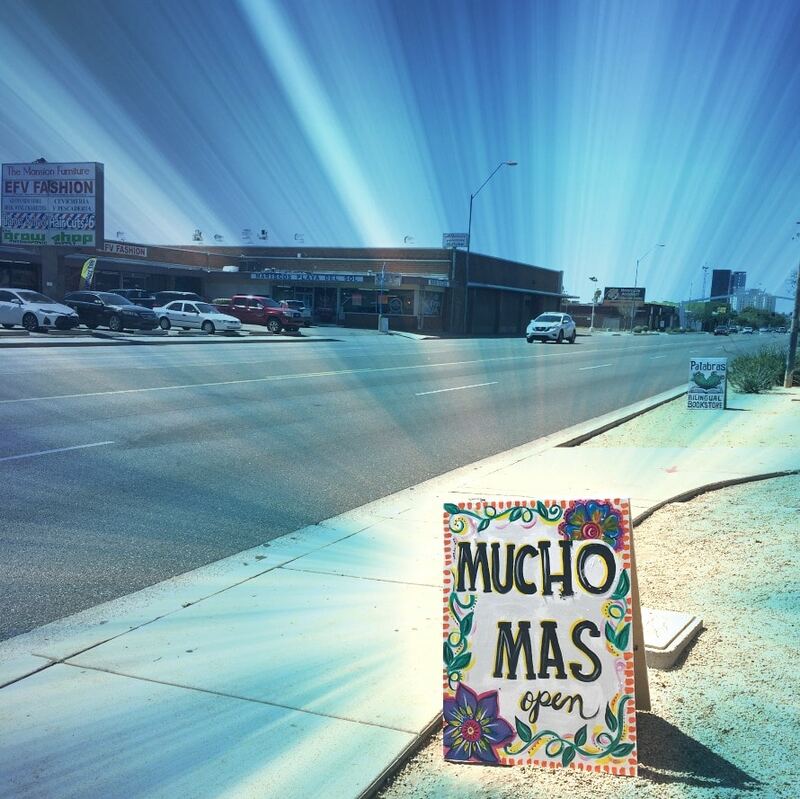 I write articles about Latino-inspired crafts, Phoenix life, recipes, pop culture, travel, entertainment, shopping, books, entrepreneurship and more! My goal is to spread positivity through creativity through my handmade goods, artwork, articles, books, product lines and workshops! See more about me here! NOTE: All tutorials on this site are for personal use only, not for commercial reproduction. Please respect the designer(s) who so graciously shared them! Kathy Cano-Murillo is a participant in the Amazon Services LLC Associates Program, an affiliate advertising program designed to provide a means for sites to earn advertising fees by advertising and linking to Amazon.com. 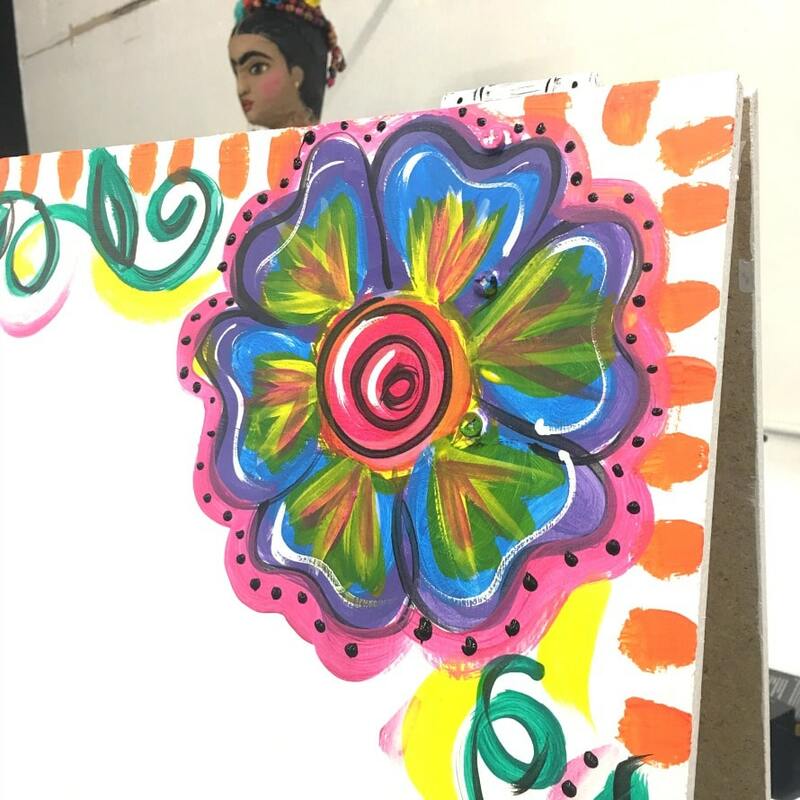 ©2019 Kathy Cano-Murillo - The Crafty Chica. All rights reserved. Website by Porchlight MCG+ Proudly powered by WordPress. Join my monthly mailing list to receive exclusive Crafty Chica printables, articles, shop discounts - and updates about new Crafty Chica products and the 2018 Crafty Chica Cruise!